The Malt Academy is a unique training institute located in Winnipeg, Canada that offers a variety of programming related to the malting barley and malt industries. The institute’s flagship 1-week intensive course in malt processing offers students theoretical and practical, hands-on instruction using the CMBTC’s state-of-the-art 75 kg pilot Malthouse and Joe White micro-malting unit. Through this program students gain the knowledge and skills required to produce high-quality barley malt as well as a thorough understanding of how finished malt attributes impact the brewing process and beer quality. The Academy also offers a 3-day program focused on the Canadian malting barley value chain including breeding and varietal development, production, handling, malt processing and brewing. There are also short courses available on brewing, beer styles and beer tasting. Malt Academy instructors have significant practical malting and brewing experience, and small class sizes give students the opportunity to get hands-on, personalized training. The 1-week intensive program is targeted at people who want to learn the malting craft, brewers that wish to better understand the major raw material in beer (i.e. barley malt) or existing maltsters who wish to upgrade their skills. 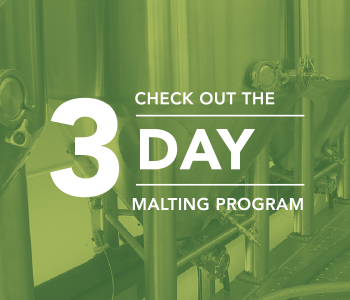 The 3-day program is targeted at people interested in an overall understanding of the Canadian malting barley value chain and high level knowledge of the malting and brewing processes. Each course is designed to provide the optimum learning experience. On site or remote courses can be developed, tailored and offered by the Malt Academy for interested companies, groups or individuals. Please feel free to contact us directly with queries. For registration questions please contact Rose Marie Bemrose at 204 984 4399. For program content, see the Malt Academy program flyer or for other questions please contact Peter Watts at 204 983 1981.